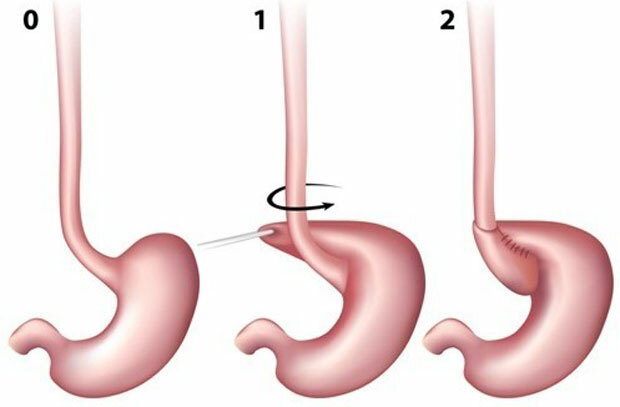 This is a minimally invasive procedure requiring a general anaesthetic in order to treat gastro-oesophageal reflux or a large hiatus hernia. The operation takes place through small incisions on your abdomen, 0.5-1cm typical size, through which gas is inflated in order to create space and make internal organs easy to see. A tiny camera (laparoscope) is then inserted into the abdomen guiding the insertion of further specialised laparoscopic instruments which are used to perform the repair. Any part of the stomach pushed into the chest (herniating) is released back from the chest into the abdomen and the opening though which the stomach is herniating is sutured approximately back to its normal size. The upper part of the stomach (the fundus) is then wrapped and sutured around the lower part of the oesophagus to reinforce the area and stop acid from leaking into the oesophagus. After the procedure you will wake up in a hospital room. Laparoscopic fundoplication is normally performed as a day case operation but sometimes patients may need to spend a night in hospital. You are typically expected to go home once you are eating and drinking, are able to manage the pain and walk unaided. After the procedure you will need to follow a special diet mainly consisting of liquid/puree diet for the first 2 weeks and soft diet for another 4 weeks, in order to allow for the swelling to settle around the operation side which may cause some initial swallowing difficulty. It normally takes a few weeks to fully recover from a laparoscopic inguinal hernia repair and return back to work but it varies from person to person and depends on their general health and the nature of their work. You should avoid any heavy object lifting or strenuous exercise for at least 6 weeks to reduce the risk of the hernia coming back. The risk of complications from a laparoscopic fundoplication or hernia repair include those common to all surgical procedures such as infection, bleeding, blood clots, heart problems, pneumonia, urinary retention and anaesthetic risks. Complications specific to this operation include a risk of long-term swallowing difficulty, gas bloating, dumping syndrome and injury to the oesophagus or stomach. With time sometimes the hiatus hernia may come back requiring the need for further surgery.